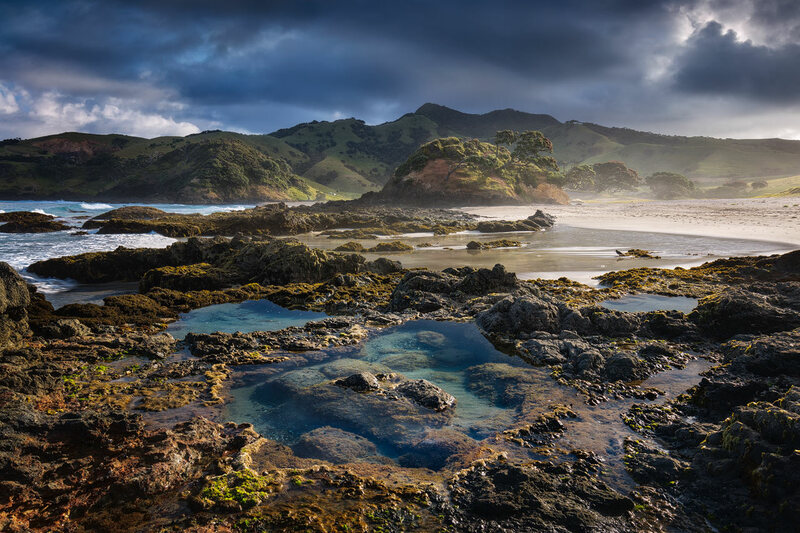 New Zealand is a dream for travellers and landscape photographers. A little over a year ago I had the pleasure to visit this wonderful country for the second time already. During our travels around the world it was our next stop after leaving Australia. The last time we had been to New Zealand, we had explored both the North and the South Island, with our focus mainly on the latter. We had been travelling during November and the weather was very unpredictable with lots of wind and rain. Especially while we were travelling through the North Island it was bad. When visiting Tongariro, for example, it was impossible to do the Crossing due to heavy winds and we moved on without taking any photo of the volcanos. So I still had a score to settle. 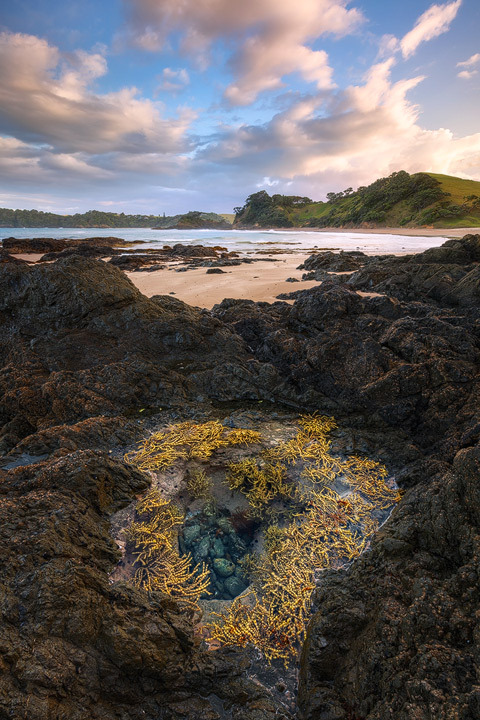 But first we went north to explore the beautiful coasts of Northland. Since we arrived quite late in Auckland and didn’t want a too long drive, we decided to head west first. The coast west of Auckland is quite rough with lots of cliffs and sea stacks. It’s the perfect place to capture dramatic seascape photos. Of the many places that we could have visited we selected Piha. With a huge sea stack dividing the mile long beach and a nice caravan park just 300 meters from the coast, it was the perfect place to start our travels through New Zealand. After the last days in Australia I was quite spoiled with spectacular light and I was hoping for my streak of luck to continue. But first it started to rain. I used the time to explore the beach in all directions and found some nice rocks during low tide. As usual I had checked the tide forecast beforehand and knew that low tide would coincide with sunset the following day. But as I went to the beach it was still raining. Hope grew as I saw a band of light at the horizon. The clouds appeard to disperse a bit and just as the sun dropped beneath the horizon they broke and the sky glowed in beautiful reds and magentas once more. I couldn’t have hoped for a better start for our New Zealand adventure. Our next stop was the Bay of Islands. From Piha we drove straight up to Russell, where we stayed at Orongo Bay Holiday Park. The camping area was great with lots of space and some nice bush walks starting right at the park. Supposedly you can spot Kiwis there from time to time in the evening. But we weren’t that lucky and only saw some Wekas. The next day we explored the Bay of Islands. I found it hard to photograph without getting on a boat or a small plane for a scenic flight. The coast of the mainland didn’t provide many photo opportunities. But I had already suspected this and looked a little farther east during my research. Half an hour’s drive from Orongo Bay we found the beautiful Elliot Bay. 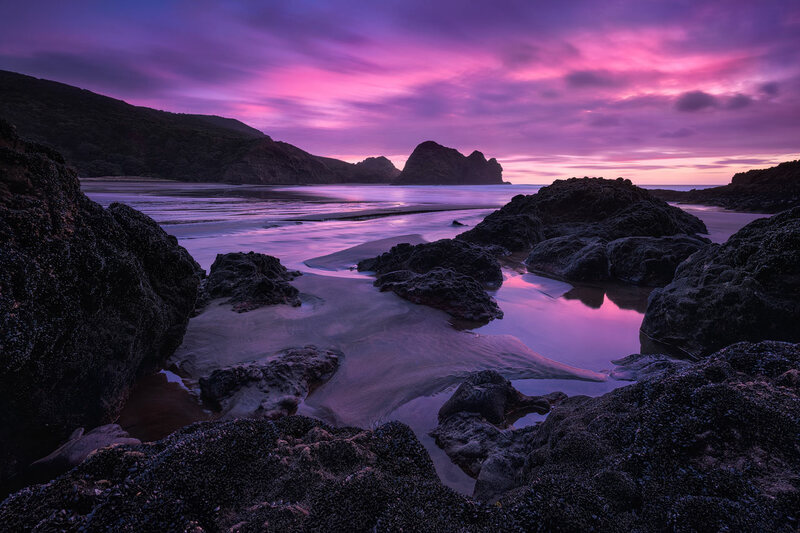 With sea stacks, rocks and tidal pools this beach had all the subjects I needed for a spectacular photo. It also wasn’t too hard to find a composition to combine all those ingredients. The only thing I was missing on the first evening was the right light. But we weren’t in a rush and decided to return again the next evening. The ability to return to a place during travelling multiple times is very important in my opinion. On the first visit I normally don’t know an area well, even if I have spent hours researching it. And I don’t know how the light changes the look of the land. So instead of swithing locations each day I normally try to plan at least two days at a location. This way I might visit and photograph less places. But by slowing down I get to know those places much better and I’m usually much more able to take photos, which capture what they are about. At Sandy Bay we made our next stop and found one of the best campsites of the whole trip. It was a free campsite, which we were allowed to use because we had a self-contained Jucy Condo. 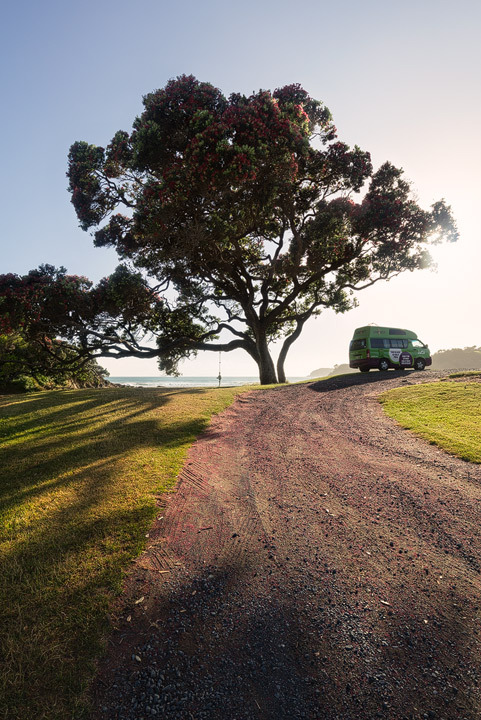 Right at the beach, beneath a huge Pohutukawa tree we set up camp. To find such campsites, I used the invaluable Rankers app. With this app I got informations about holiday parks as well as free campsites and also about the conditions for camping at those. Just a short walk from Sandy Bay lay the little Daisy Bay. Down there I went exploring again, searching along the coast for interesting rock formations and tidal pools. Although it’s more of a sunrise location, it also worked during sunset. There was no direct light hitting the slopes around the bay, but with the low tide I was able to find an interesting foreground, which was submerged when I returned the next morning. Whangarei was the next stop on our tour through Northland. It’s a small mountainous pensinsula with several beautiful beaches. 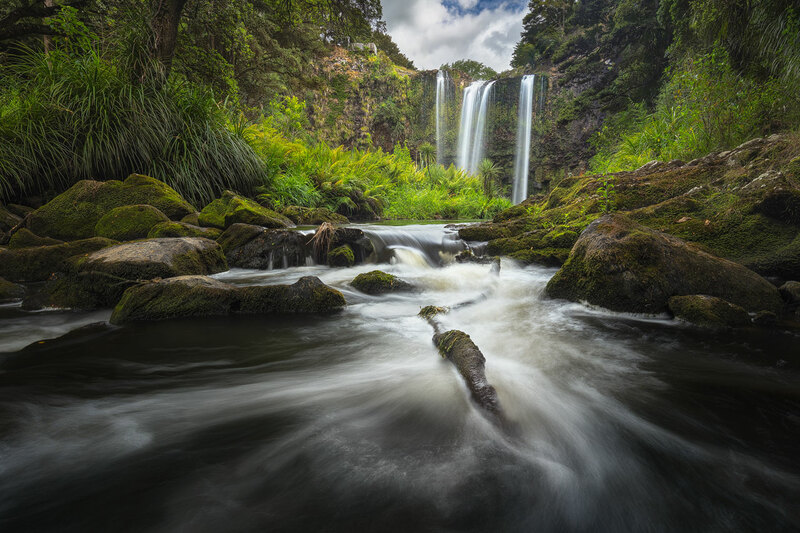 But before visiting those we went to Whangarei falls. I didn’t expect much as I pulled over at the huge parking lot. It was right next to the road, so why not give it a chance. From the viewig platform at the top of the falls I could already see the place from where I wanted to take my photo. I hadn’t done any research of the area but I could already previsualize the photo I wanted to take. After a quick stroll down to the river I quickly found a composition, which hid the stream of visiters in front of the falls. And except for the viewing platform at the top left of the waterfall, this photo could easily have been taken in midst of a jungle. One hour later we finally arrived at our stay for the next three days. Since it was Christmas time we had decided to rent a Bach and spent a more relaxed time during the holidays. With the Kiwibach at McKenzie Bay we found the perfect holiday home. After so many weeks in the campervan it was great to finally have a real roof above our heads again. 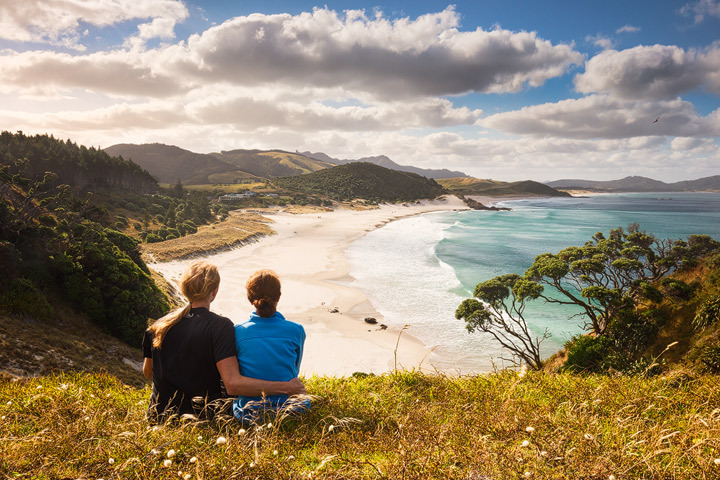 The following days I hiked up onto the various little mountains in the area and we also explored many of the white sand beaches that Whangarei has to offer. It was great to spent Christmas Eve in shorts at one of those – something I could get used to. The first week in New Zealand was great. It was summer, which is the most crowded time to visit New Zealand. But in the north we didn’t encounter that many tourists. Many of the beaches we visited we had nearly for ourselves. It was a huge contrast to Coromandel, which we would visit two weeks later. In times of Instagram it seems that as a traveller you have to visit all those places that are trending on that platform. If no influencer has been there yet, it can’t be that interesting, right? It couldn’t be farther from the truth and I often try to avoid places, which are too trendy on Instagram. But it gets harder and harder to do so. As I final word: I’m always quite open with the locations I visit. I want to inspire people to travel, to explore and to experience other countries. But I also know that many areas around the world suffer from their sudden popularity. I just hope that my photos, by showing the beauty of those places, also remind you to look after them.